Heading toward the Olympic Games in Pyeongchang, Paul Webster was spending as much time on the phone with travel agents as he was preparing Canada’s curlers to defend their 2014 gold medals. 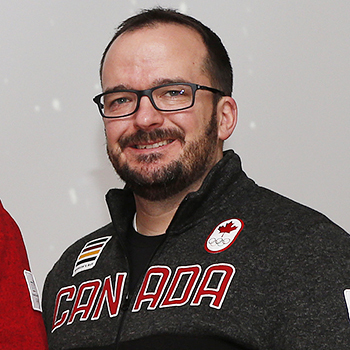 As curling team leader and chief liaison with the Canadian Olympic Committee, Webster’s work to arrange the logistics of flights, lodging and access to the athletes’ village starts two years before the opening ceremonies, culminating in a last-minute flurry to make sure Canada’s 21-strong curling contingent gets to South Korea without a hitch. But Webster will hardly be kicking back once the Games begin. The former Golden Hawk is also head coach of the men’s and mixed doubles curling teams, and he expects to be in tough against a strong field. Webster thinks the increased parity in curling has something to do with the proliferation of Canadians coaching abroad, as well as a mentality shift among athletes toward a greater focus on training, conditioning and nutrition. The veteran of three Olympics and 14 world championships has high hopes for the Canadian teams, which feature fellow Laurier alumni John Morris in mixed doubles and Brent Laing with Team Koe on the men’s side. “I’ve known those guys forever,” says Webster, who played with and against Laing as a young curler and later coached Morris for a season at Laurier. Webster is especially excited to watch Morris and Kaitlyn Lawes in mixed doubles curling, which is making its Olympic debut this year. Morris was a gold medallist as part of the men's curling team at the 2010 Olympics in Vancouver, while Lawes won gold as a member of the women's team at the 2014 Games in Sochi, Russia. Webster’s love of curling started when he was a kid growing up in Peterborough and blossomed in high school and university, helped by the chance to travel for tournaments – a thrill that has only multiplied as a professional coach. Though he had success as a young curler, including a 1995 Ontario junior men’s championship, Webster turned his attention exclusively to coaching after becoming a high school physical education teacher in 1999. He later moved to Calgary and today does triple duty as a national coach with the Canadian Curling Association, high performance coach with the Alberta Curling Federation and curling director at Glencoe Curling Club. As a coach, Webster says he strives to nurture long-term relationships with his athletes – many of whom will play competitively for decades – and constantly seeks to improve his skills and qualifications in order to be an effective leader. Webster loves the off-ice camaraderie for which curling is known and credits his Laurier experience for teaching him the importance of balancing sports and life. It was also at Laurier, listening to Wenn lecture on the history of the Olympics, that Webster first dreamed of what it would be like to represent his country on the international sporting stage. “As a 19- and 20-year-old student listening to that, it’s really hard to connect the dots that you’ll ever attend (the Olympics),” says Webster. “The opportunity is definitely there, but getting ready to attend my fourth Olympics is definitely surreal." Team Canada will have a tough act to follow after 2014, when for the first time in Olympic history the same country won gold in men’s and women’s curling. But Webster says his athletes are ready to compete and again wear the maple leaf with pride.